Adilene Rosales (3L) delivered the first Student Scholars Series lecture of the semester on January 25, 2017. 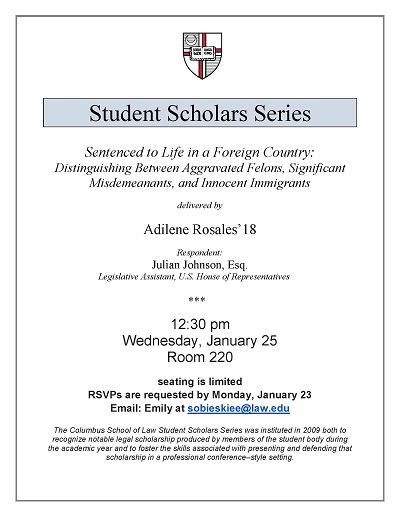 Rosales’ scholarship, “Sentenced to Life in a Foreign Country: Distinguishing Between Aggravated Felon, Significant Misdemeanants, and Innocent Immigrants,” examined the implementation of the Deferred Action for Childhood Arrivals (DACA) program through a series of memoranda issued by the Secretary of the Department of Homeland Security. Rosales, Adilene, "Sentenced to Life in a Foreign Country: Distinguishing Between Aggravated Felon, Significant Misdemeanants, and Innocent Immigrants" (2017). Student Scholar Series. 27.